The above map shows earthquake activity in the United States in the past week: These maps requires the Google Earth browser plugin. Download the plugin here. A 5.8-magnitude temblor shook much of the densely populated East Coast Tuesday afternoon, including Washington, D.C., and New York City, with reports of tremors being felt as far as Ohio, Canada and the Carolinas. The earthquake was centered in Mineral, Va. — 27 miles east of Charlottesville and 39 miles northwest of Richmond, according to the U.S. Geological Survey. There have been no reports of damage or serious injuries, but plenty of disruptions to daily life being reported around the East Coast. This marks the largest earthquake ever recorded in an area known as the Central Virginia Seismic Zone, said USGS geophysicist David Applegate. But to put in perspective, the 9.0 earthquake that struck Japan earlier this year released 33,000 times more energy than a magnitude 6.0 quake, he said. People in Washington, D.C., and Northern Virginia — many of whom are unaccustomed to quakes — rushed out of buildings and into the streets. The White House, the Pentagon and the Capitol were among the buildings evacuated. Cell phone networks were jammed with people calling loved ones, and airports grounded some flights. Several nuclear power plants have reportedly been taken offline. Earthquakes in the Eastern United States are usually felt over a much broader area than earthquakes of the same magnitude out west, Applegate said. This is due to a combination of things. “The crust tends to be older, it tends to colder and it transmits energy very efficiently.” Plus, thick accumulations of sediment in the Eastern U.S. amplify the shaking. In 2008, for example, an earthquake that struck near the Illinois border was felt over 16 states, he said. “Much of the United States is threatened by earthquakes, not just Alaska and the West Coast. Great earthquakes have struck the East Coast of the United States and they could again,” Robert Hamilton, author of a recent National Academy of Sciences report, told the NewsHour. The East Coast quake came a day after Colorado experienced its largest natural earthquake in more than a century, when a 5.3-magnitude quake struck near the city of Trinidad. 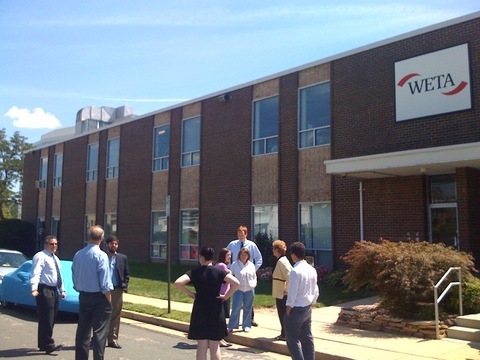 NewsHour and WETA staffers briefly evacuated after the quake, which was centered about 90 miles southwest of our studios. Did you feel the quake or notice any damage? Leave a comment below. Jason Kane and Dave Gustafson contributed to this report.